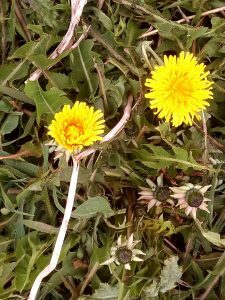 Dandelions (Taraxacum officinalis) are blooming everywhere! They are a perennial herbaceous plant that grows up to 15-30 cm and it blooms from spring to autumn. There are so many uses for dandelions. Leaves are somehow bitter, they resemble rucola in their taste, and they can give a wild twist to your spring salads. Flowers are also edible and you can use them for making syrup just using the petals, sugar and some lemon. But did you know that the roots are also used to make coffee??!?! Dig up a large bunch of dandelion roots. 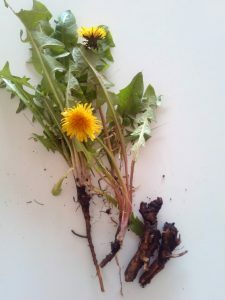 You need to wash your dandelion roots as best as possible, an old toothbrush can be useful. Then slice the dandelion roots into chip-like pieces and put them in an oven tray. Roast the dandelion root for 1 hour or more on 100°C. The roots need to be brown and dried outside and inside. When the roots are cool you can finely grind them. 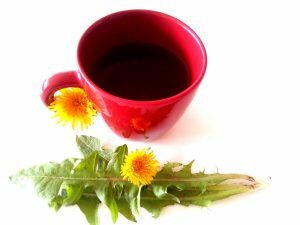 To make the coffee you need to pour 1 small tablespoon of dandelion coffee in a cup with boiling water, wait a couple of minutes and then filter the coffee. It is ready! You can serve with milk and honey or add a little bit of cinnamon.